Rasam is a south indian curry usually had with rice. It is made with tamarind, tomatoes, pepper, cumin, garlic, lentils etc. 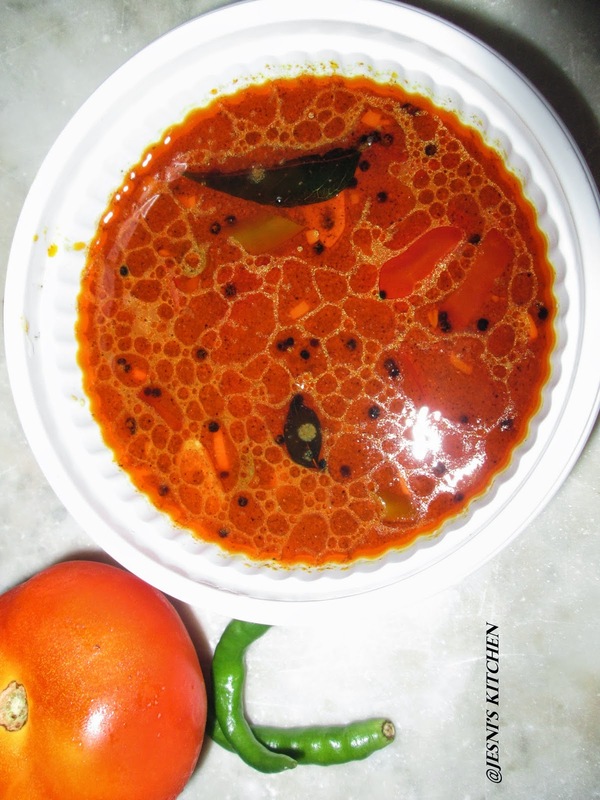 In the traditional 3 course south indian meal(Sadya), it is usually had as a second course with sambar being the first course and curd being the grand finale.There are many different types of rasam based on the ingredients used. But the basic recipe remains the same, the recipe that is given below. The additional ingredient is added to the basic rasam to enhance and change its flavour. Soak the tamarind in warm water for 5 minutes to get tamarind juice. Heat little oil in a pan, add the garlic, green chilly and tomatoes. Let the tomatoes cook for while, until they become soft and juicy. Now add tamarind juice, and powders,asafoetida,salt and water. Bring it to a boil then reduce the flame. In the meanwhile, heat oil in pan, add mustard seeds and curry leaves. Once it splutters add it to the rasam.Tasty rasam is ready to serve. Plain rice with rasam is an excellent combination.